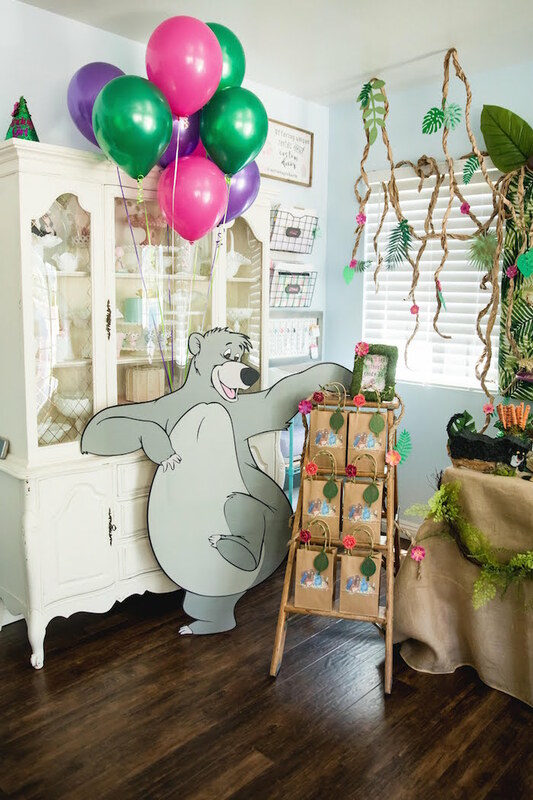 Balloo, Mowgli and Bagheera too, this Jungle Book Party Made for a Princess, is swinging right for you! 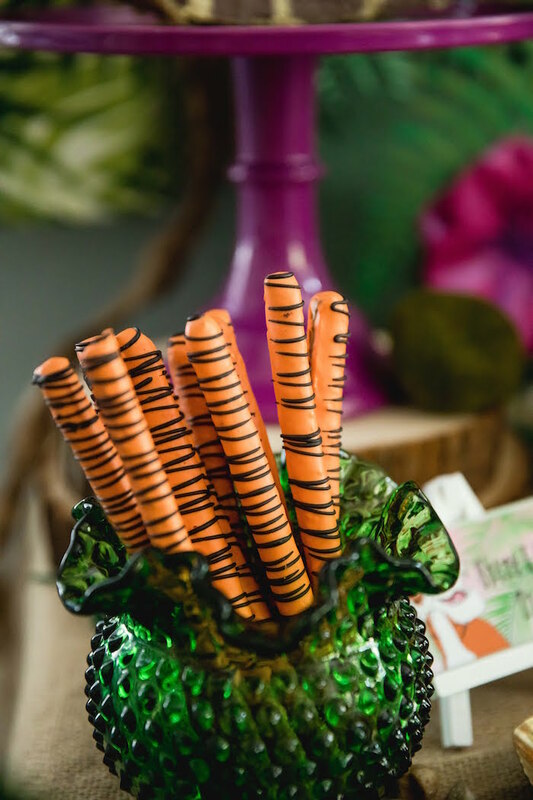 Filled with jungle fun, for man-cubs of all ages, this darling party by Tiffany Hayter of OC Vintage Charm, out of Mission Viejo, CA, is packed with bare necessities you’re sure to sign to! 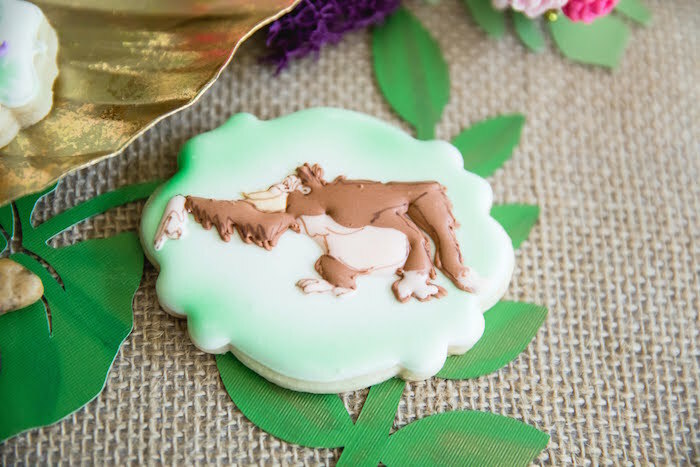 And Cute Jungle Book-inspired Cookies! 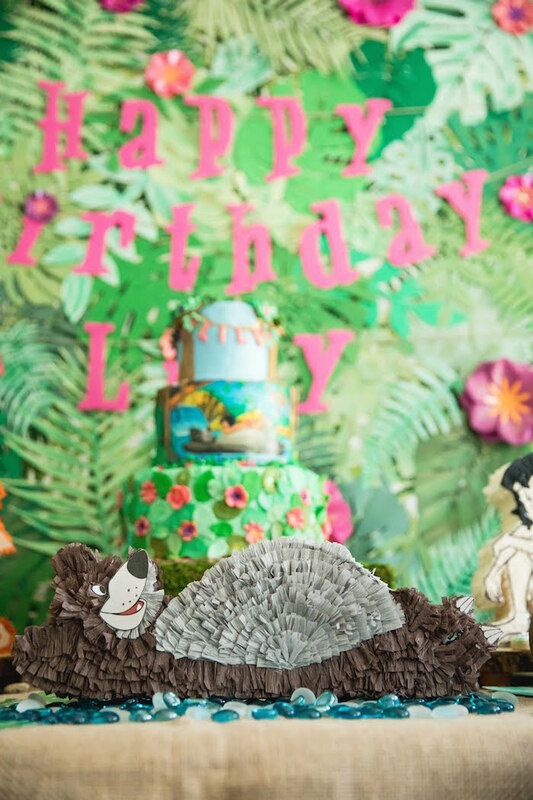 This is what Tiffany shared about styling the party- “This year my little girl turned 4 and was adamant about having a Jungle Book birthday party. 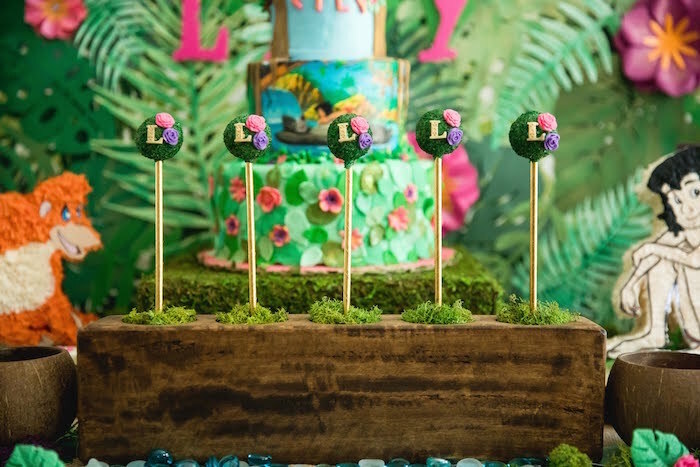 I tried my best to drop hints on other party themes that were a bit more girly but she wasn’t having it. 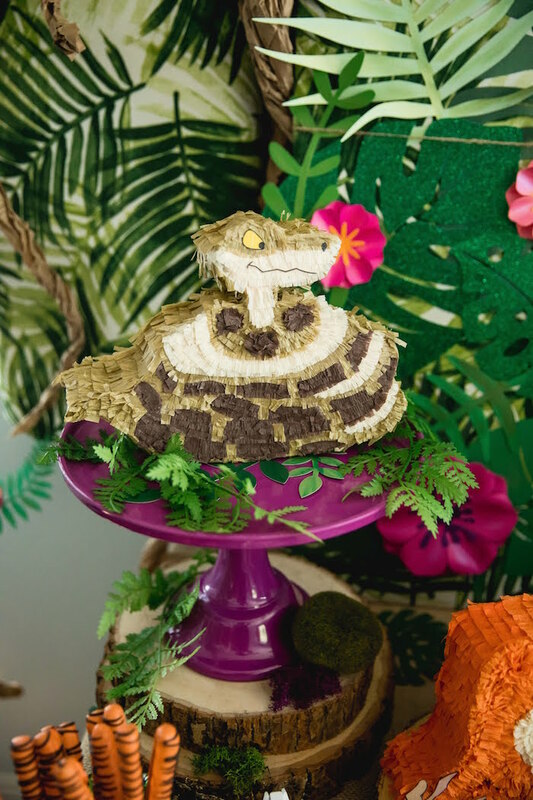 If you search for girl Jungle Book parties, there is nothing out there. 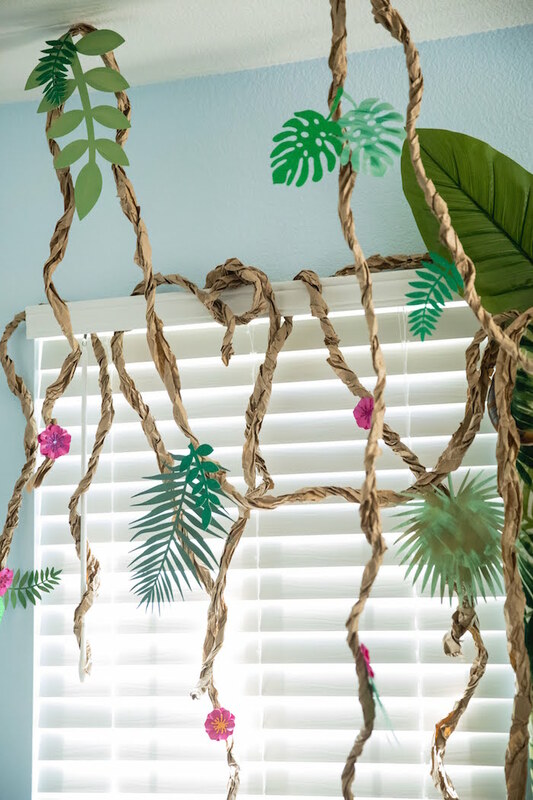 I’m a DIYer so I had to figure out a way to make it look and feel like a jungle but also give it that feminine touch. The first thought that came to mind was: FLOWERS! Flowers grow in the jungle, right?? 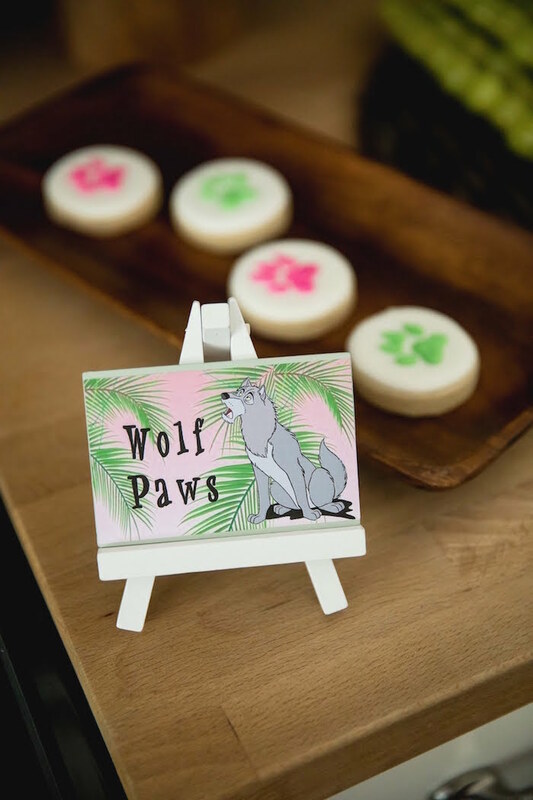 I whipped out my Cricut machine and started to cut hundreds of flower templates so I could add some color to this party. I hand painted each flower with Lumiere metallic paint to add some shine and texture. For me, the details are key! 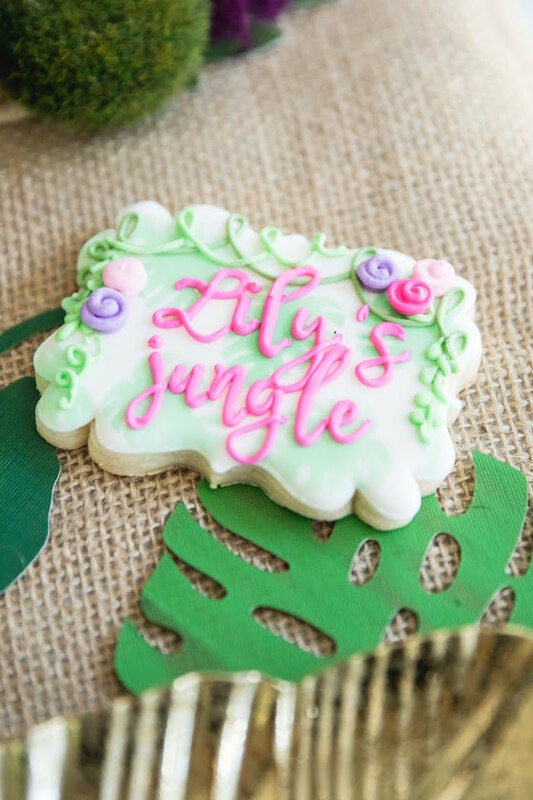 To create the jungle feel, I cut leaves using SVG templates from Red Earth and Gumtrees. To add some shimmer I used glitter cardstock for leaves and hand painted the rest with more metallic paint. 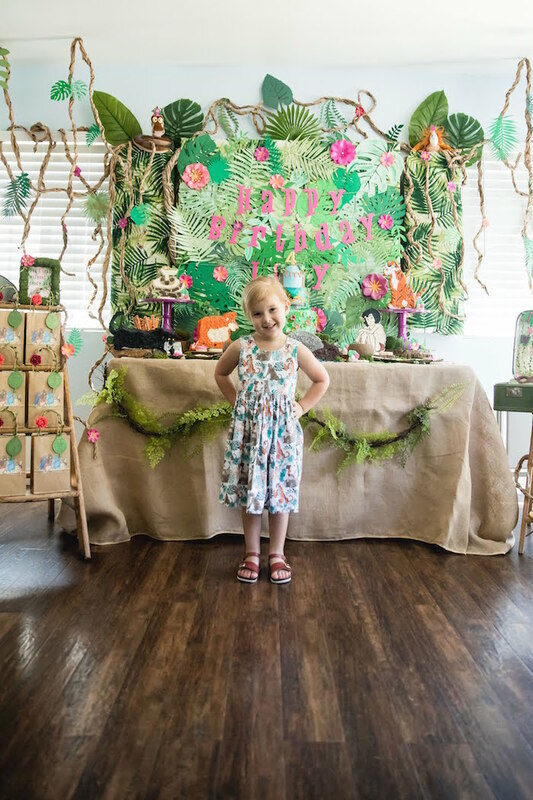 I created a 4’x4’ backdrop layering leaves, flowers and a handmade glitter birthday banner in hot pink. 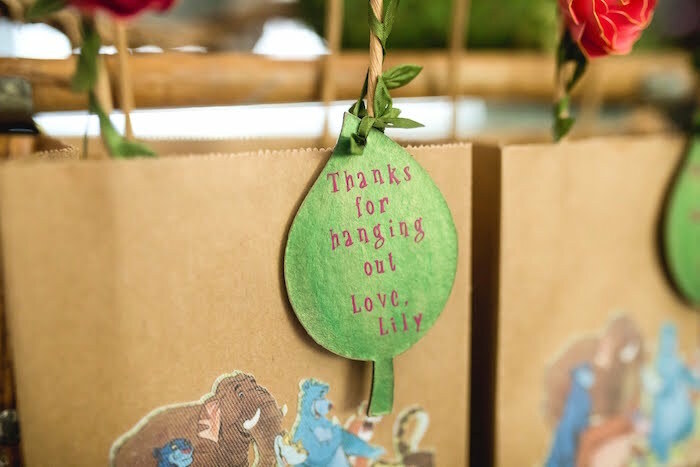 Using brown paper lunch bags, I created tree vines that I hung from the ceiling with small Command hooks. I sporadically attached leaves and flowers to tie it all together. 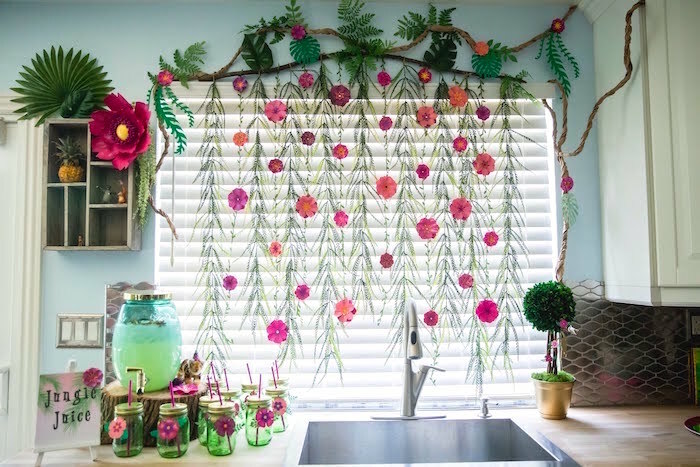 These vines were so easy to make and really brought out that jungle feel. 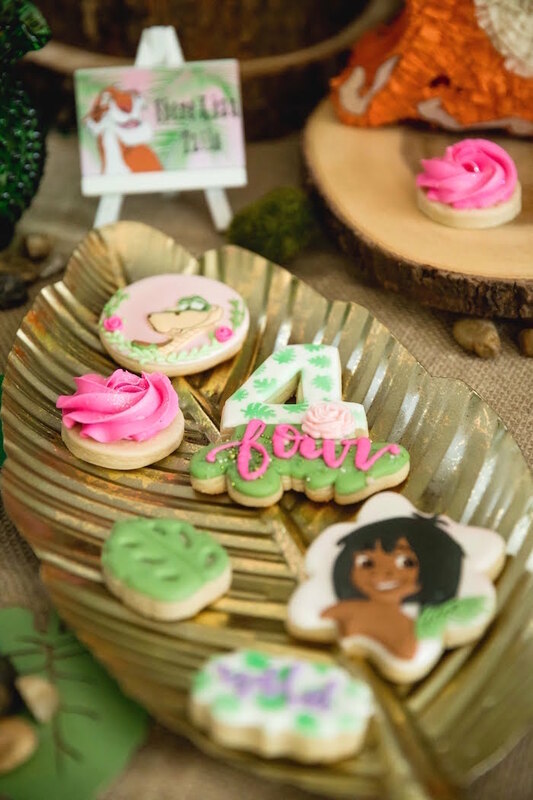 Since I wanted to create a “Jungle Book” birthday party but not OVERDO it with characters, I decided to limit the elements that had character images on them. 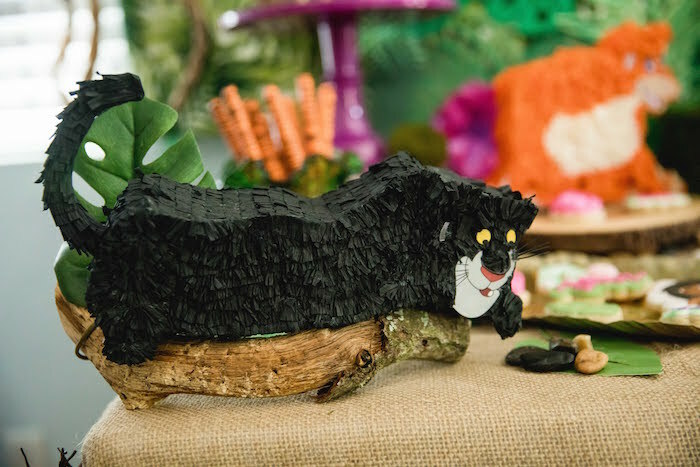 For the dessert table, I teamed up with Jamie over at JDJ Designs 2 to create custom mini piñatas of Mowgli, Baloo, Shere Khan, King Louie, Bagheera and Kaa. Jamie is the true definition of talent so I was excited to see what she would come up with. 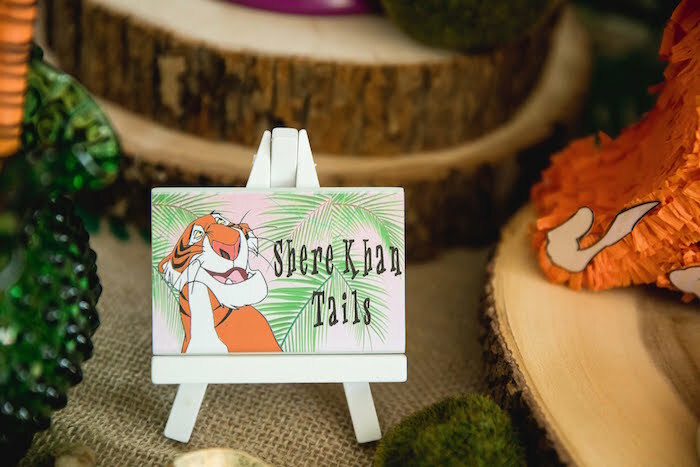 I’m all about details and these little guys were just perfect from the whiskers on Bagheera, to the stripes on Shere Khan. 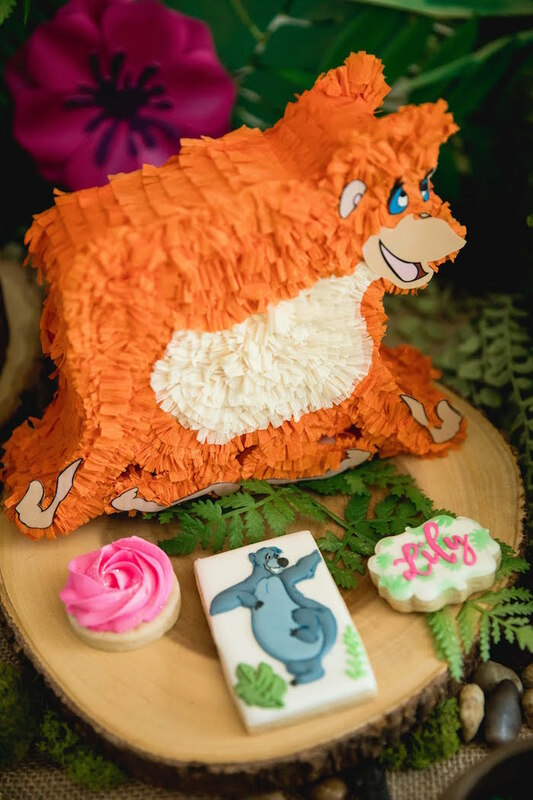 I worked with Cristy from Frosting Avenue to come up with an amazing 3 tier cake that knocked my socks off; every little detail was absolutely gorgeous! 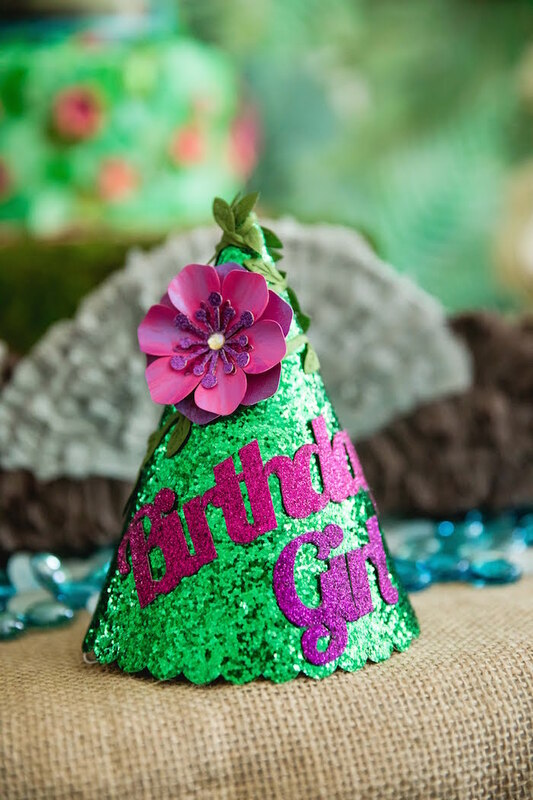 She added sparkle and shine with little matching flowers to make sure it fits in with my whimsical girly party. Just stunning! 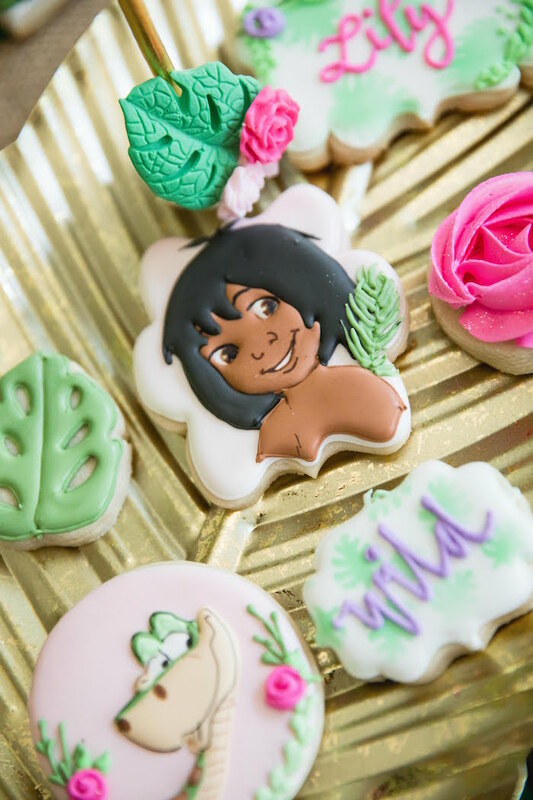 Ingrid from Sweets by Gigi didn’t disappoint with her lifelike cookies of Mowgli, Baloo, Kaa and King Louie. 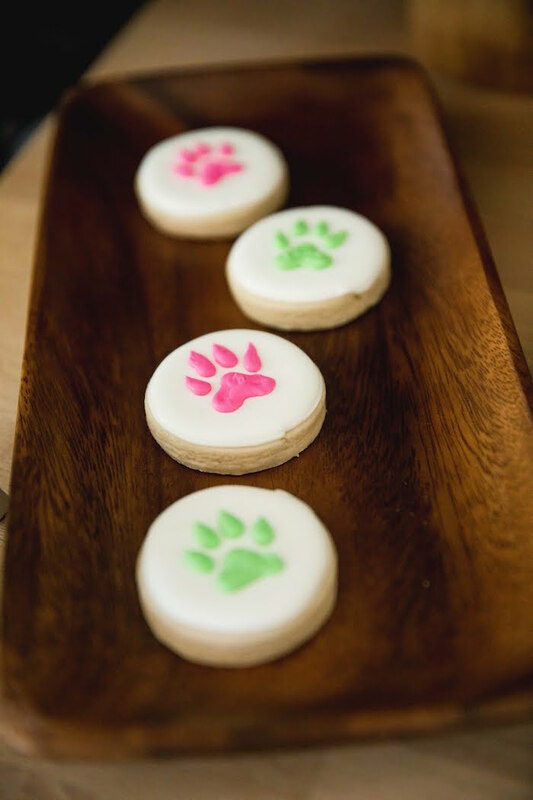 Her gift of making your cookies come to life is always so special to watch. 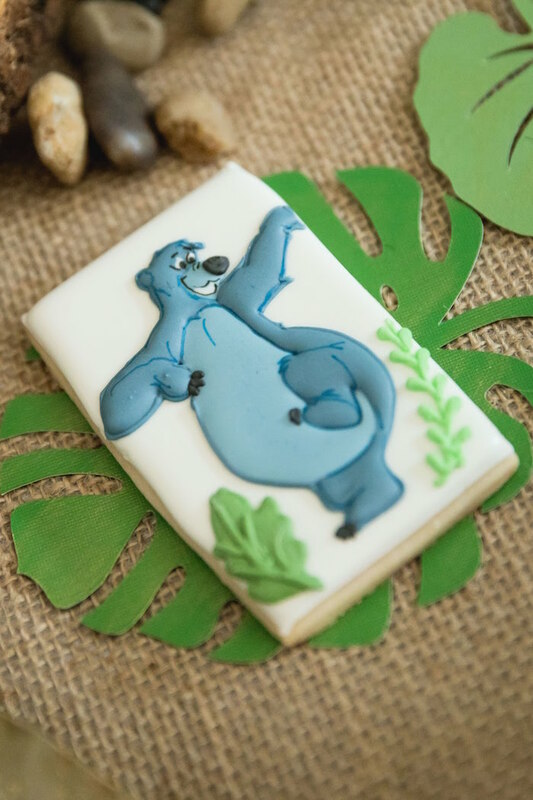 With the help from my Cricut machine, I created a 4’, off the mat, character image of Baloo. He was a show stopper and the kids LOVED him! 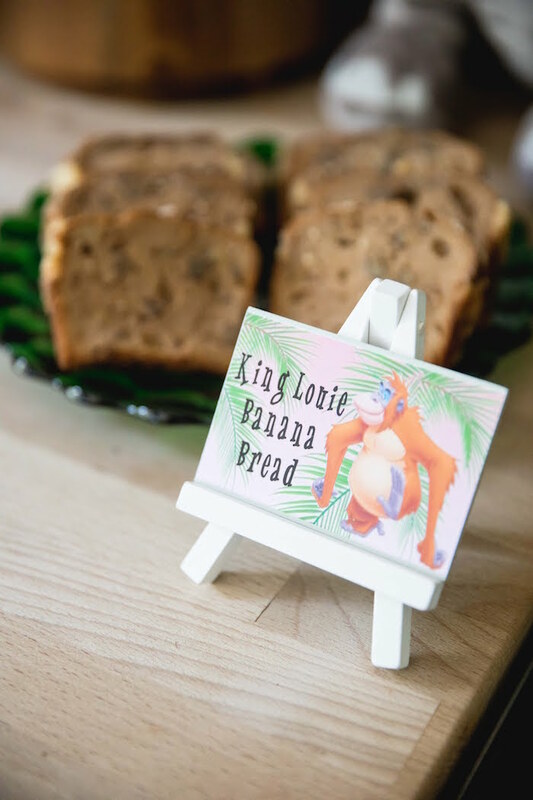 I used my new knife blade with my Cricut Maker and created wood cutouts of King Louie to hang from trees. 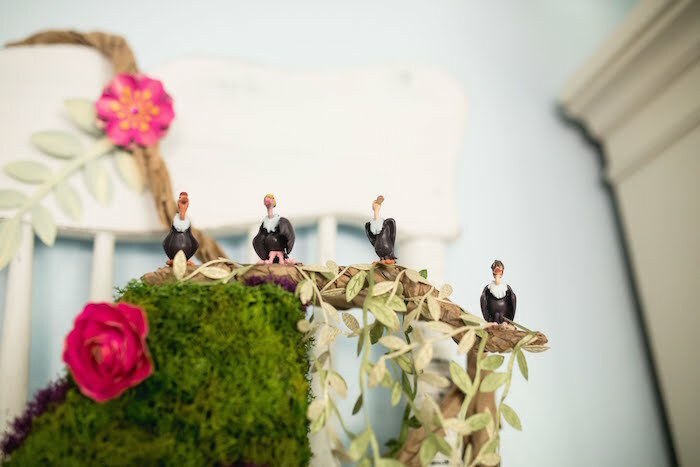 Adding him to a vine ribbon, and gluing on some flowers for color, was a perfect touch. 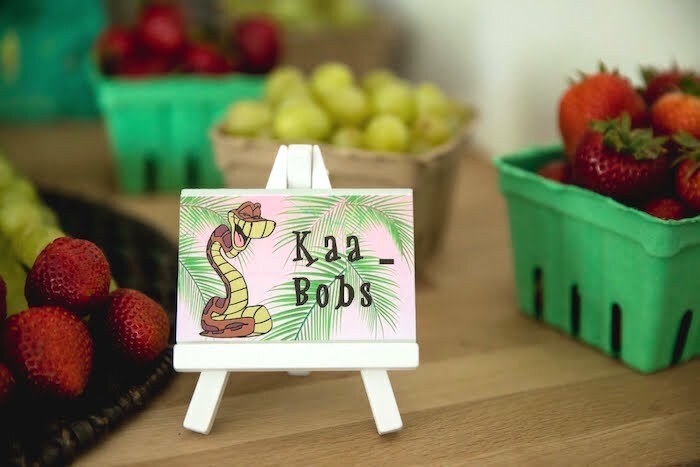 Small chalkboard signs with character images added a fun spin on some of the featured food. 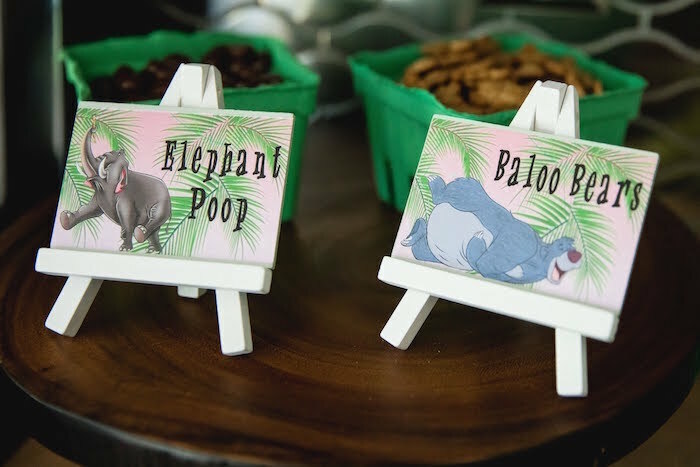 We had Shere Khan Tails (chocolate covered pretzel rods that were orange with black stripes), Kaa-Bobs (grapes on a kabob stick to look like a snake with strawberries as the head), Elephant Poop (chocolate covered peanuts), Baloo Bears (teddy grahams), Wolf Paws (cookies from Sweets by Gigi with paw prints on them), Cub Sandwiches (platter of sandwiches) and King Louie Banana Bread. We also had Jungle Juice (lemonade with snakes on the top). 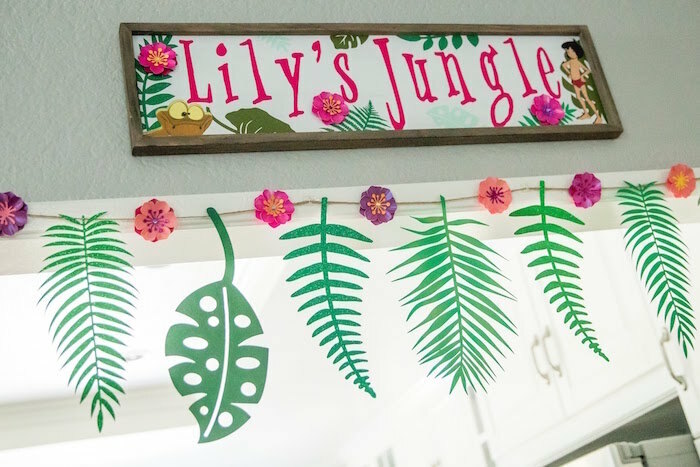 I created a Lily’s Jungle wood sign for the entrance of the party that featured Kaa and Mowgli which are my daughter’s favorite characters. 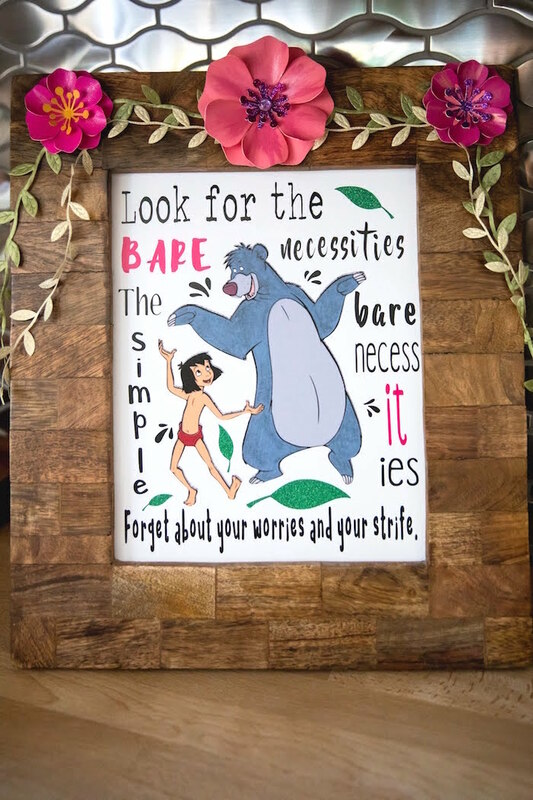 A little Bare Necessities made an appearance on a custom framed piece I made with vinyl and printable vinyl. 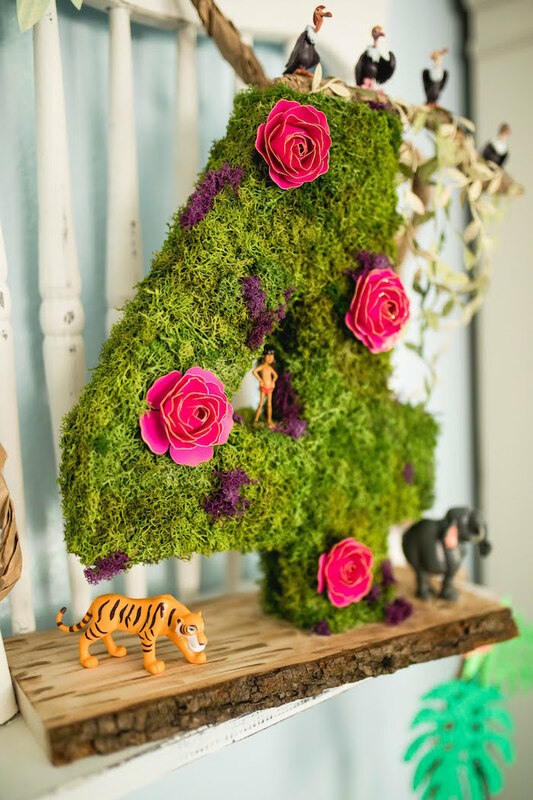 Then, I added handmade flowers and vine ribbon for that girly jungle feel. 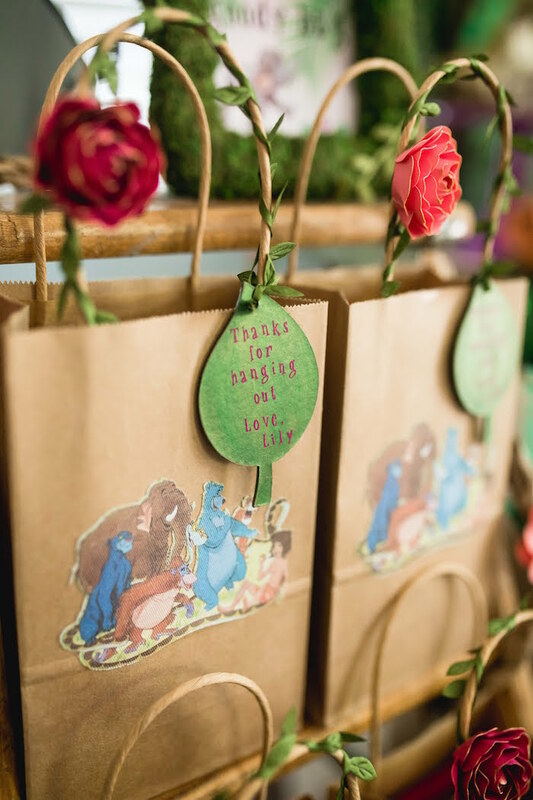 For the goody bags, I used Cricut printable fabric to print an image of the Jungle Book gang. 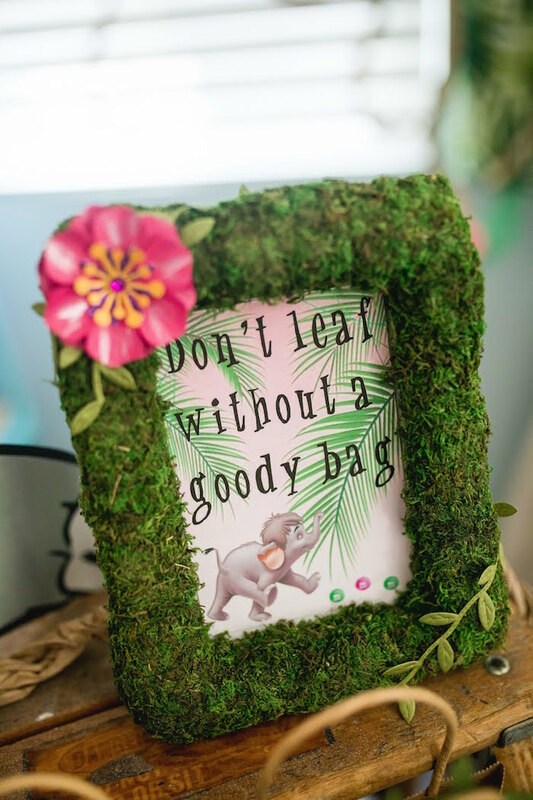 I created a sign with little Hathi Jr. telling you “Don’t leaf without a goody bag” who was following a trail of M&M’s, which is my daughter’s favorite candy. 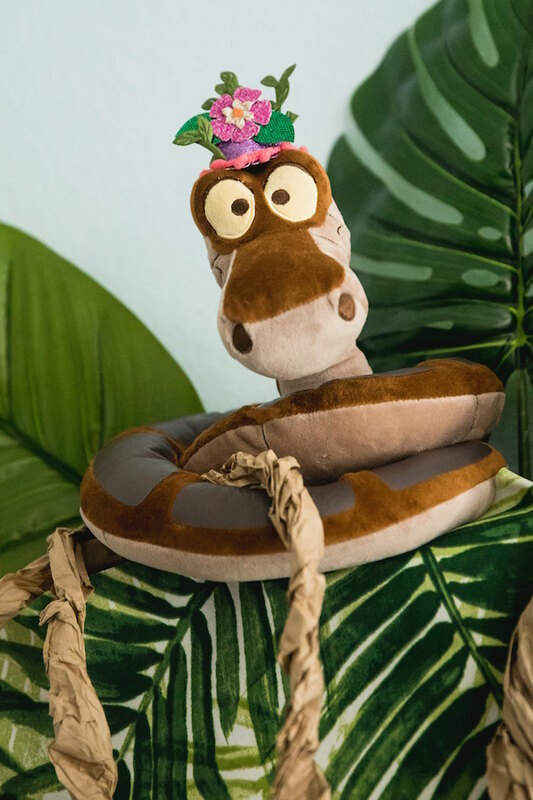 The goody bags not only featured some of the characters from Jungle Book but they also had that whimsical jungle feel. 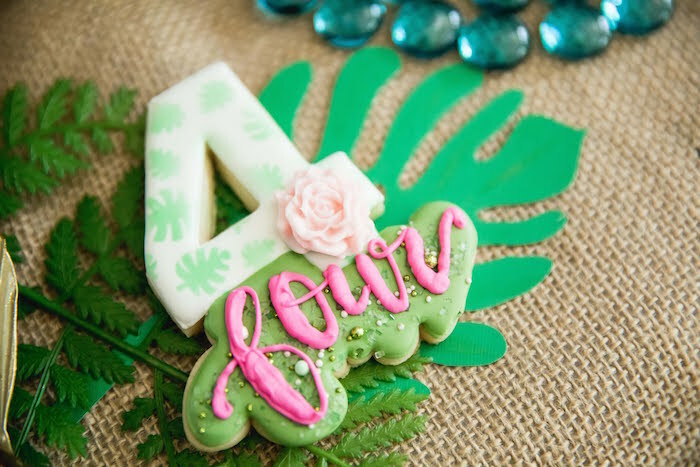 I cut out chipboard leaf tags with my Cricut knife blade and painted them with Lumiere metallic paint. Then, I added vinyl for the wording. I twisted vine ribbon up the handle of the kraft paper bag and attached a handmade paper flower with gold accents. 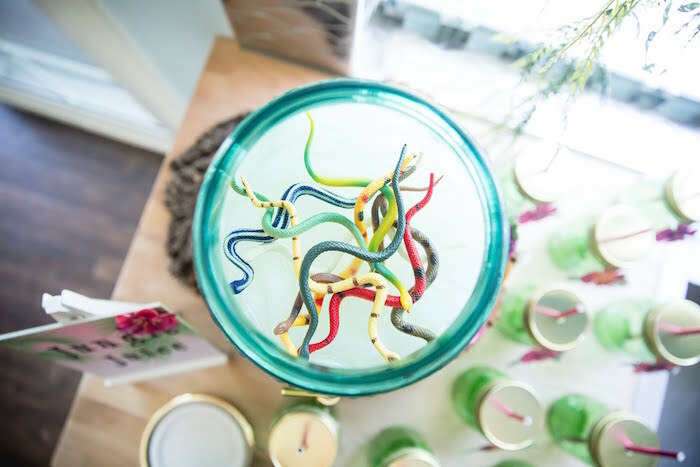 I displayed them on a vintage ladder with vines wrapped around it. 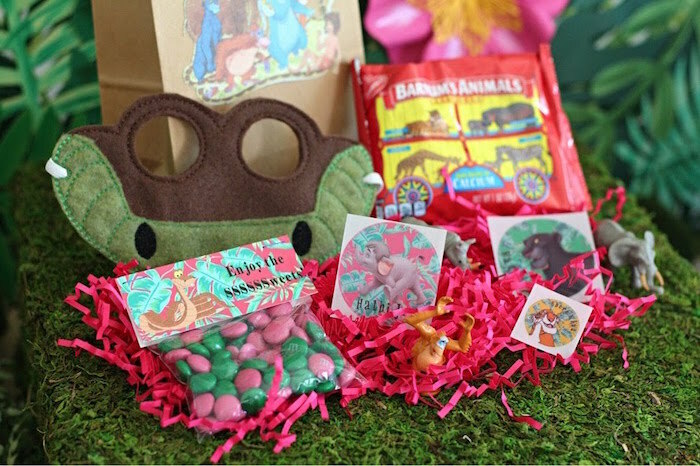 Goody bag contents consisted of a Jungle Book character mask, handmade stickers, an M & M bag with a handmade Kaa tag, animal crackers, and animal figurines. 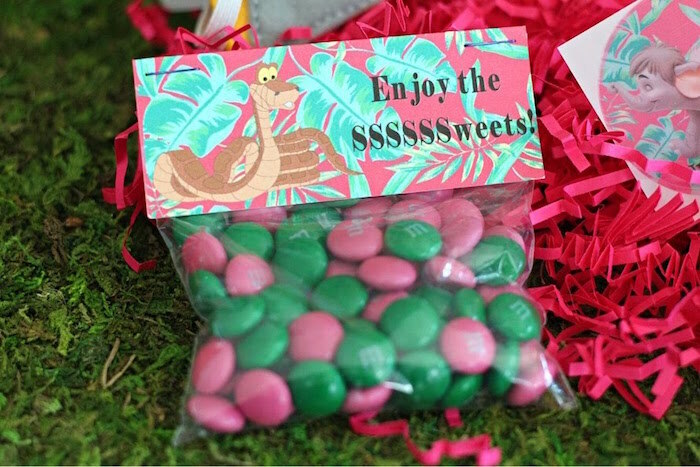 Fun little elements I also created were party hats for the Jungle Book stuffed animals I had hanging around and a party hat for the birthday girl. 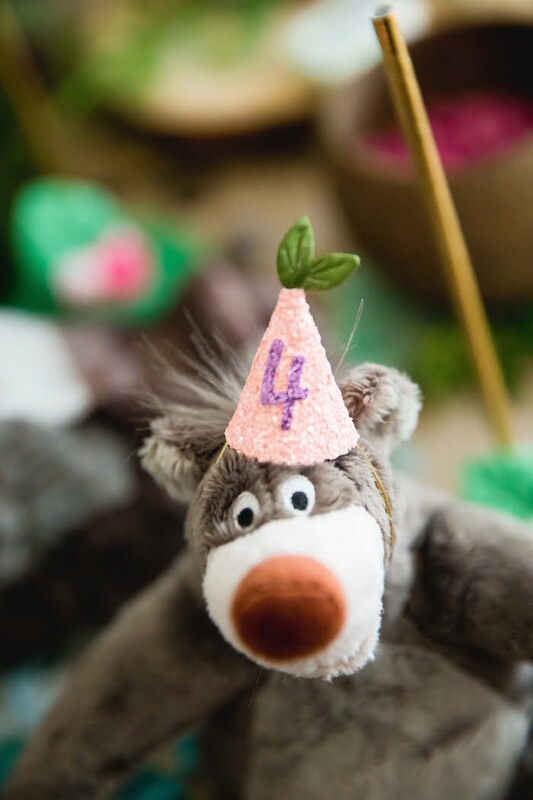 What’s a birthday party without party hats? 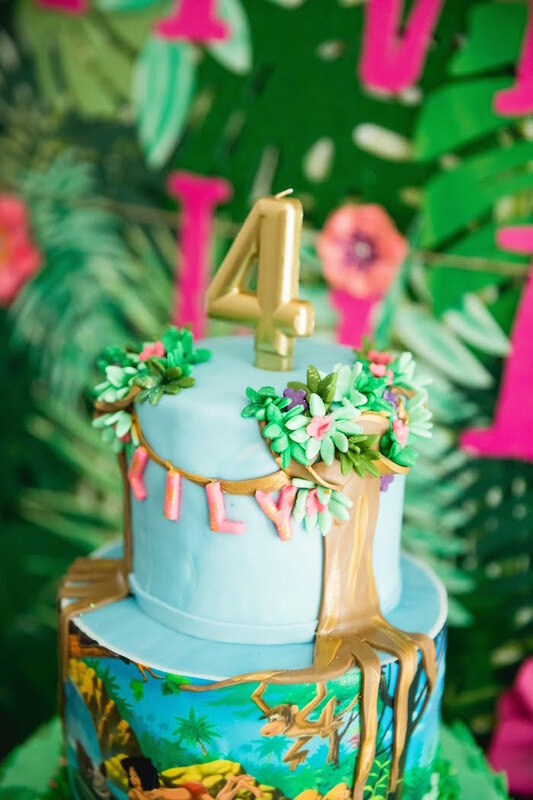 I used my Cricut machine to assist with cutting the glitter fabric sheets and decorated them with cutout flowers, 4’s, polka dots and added vine ribbon and small pom-pom trim. They ranged in size from 1.5”-6” tall. The DIY fun didn’t stop here either. 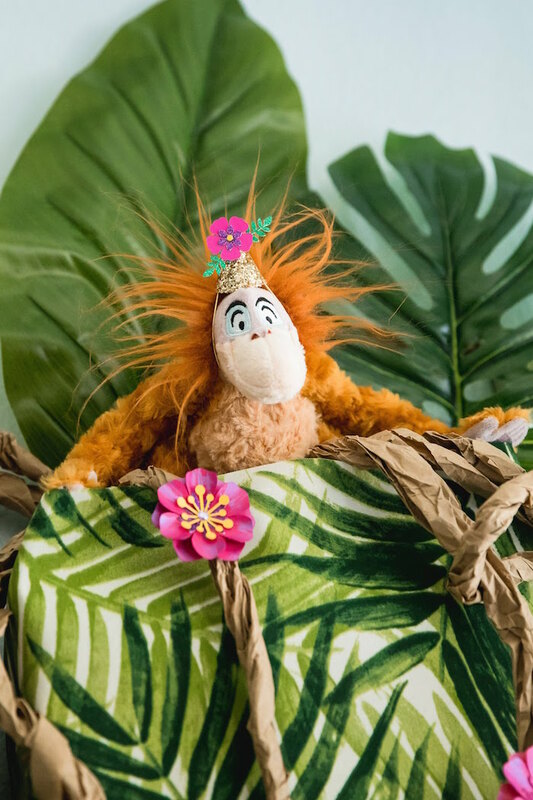 I found darling Jungle Book character masks from Mythos a la Mode on Etsy and had to have them for a dress-up station. 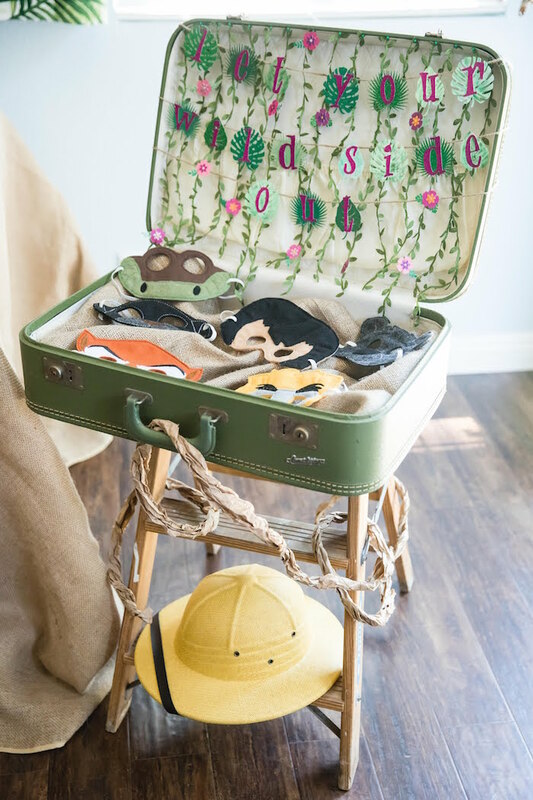 I used a vintage olive green suitcase to display the masks and created a fun “Let Your Wild Side Out” banner in jungle leaves, vines, and tiny flowers. Displaying the suitcase on another vintage ladder tied the goody bag display in nicely. 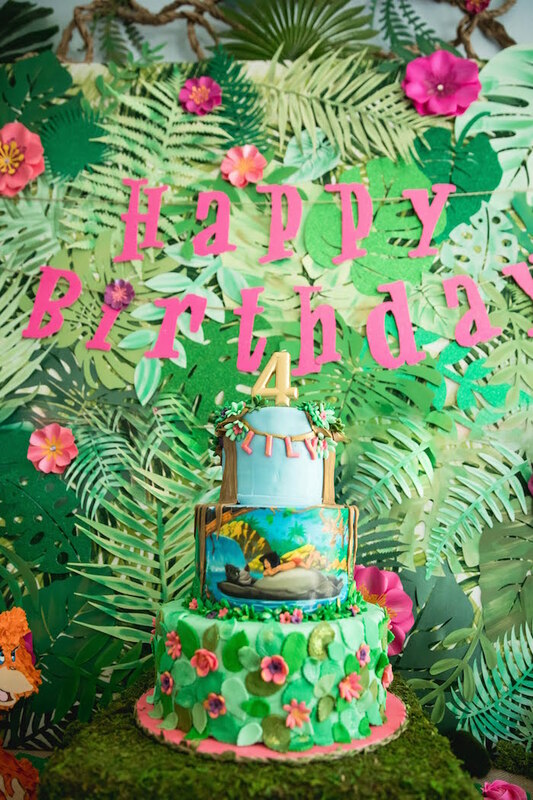 To commemorate my daughter turning 4, I used a cardboard #4 and turned it into a miniature Jungle Book scene. 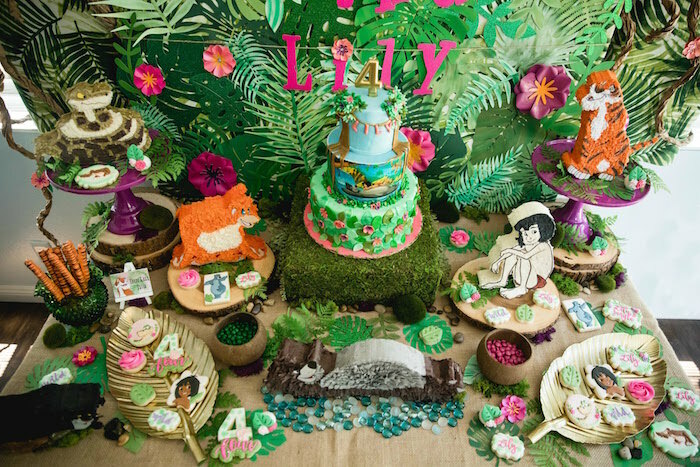 I glued preserved moss to the 4, added handmade flowers, a handmade branch, some vine ribbon and a few Jungle Book characters. I glued this to a wood sliced base that I inked to give it more texture and depth. Lily’s party was held in the kitchen of our family home. 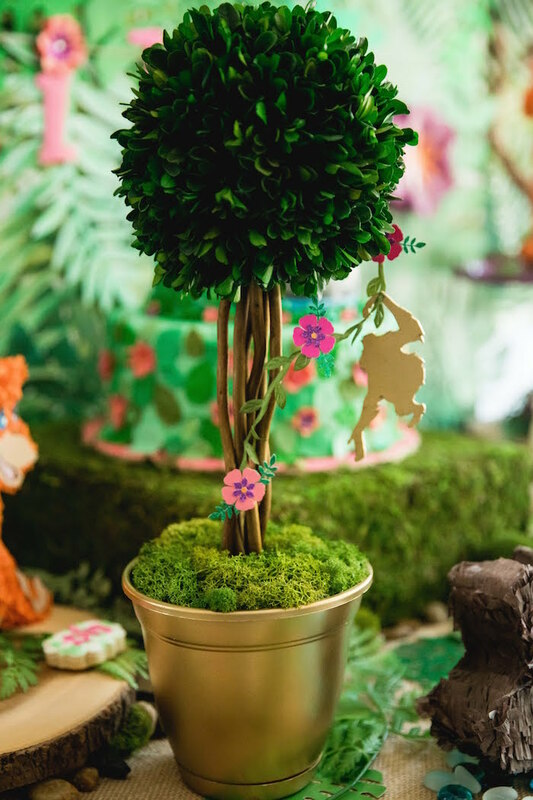 I tried my best to camouflage what appeared to be a kitchen and turn it into a whimsical jungle. Above our kitchen sink I decided to use a large stick I found from a tree outside our home and hang artificial vines from it. 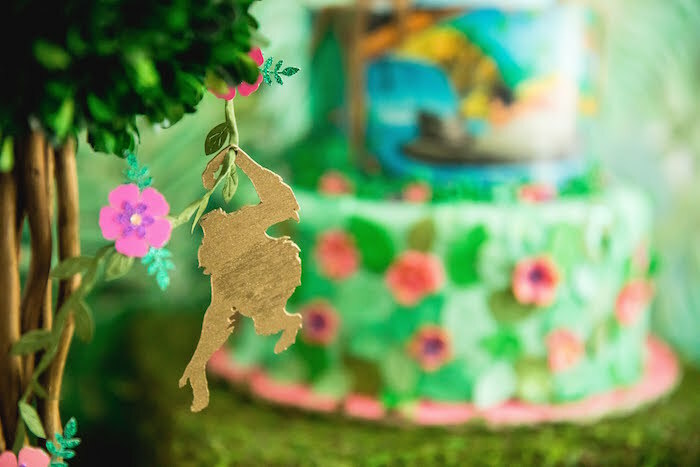 To add some color, I added flowers on vine ribbon and attached to the stick as well. I finished the wall off with paper vines, handmade leaves and flowers. 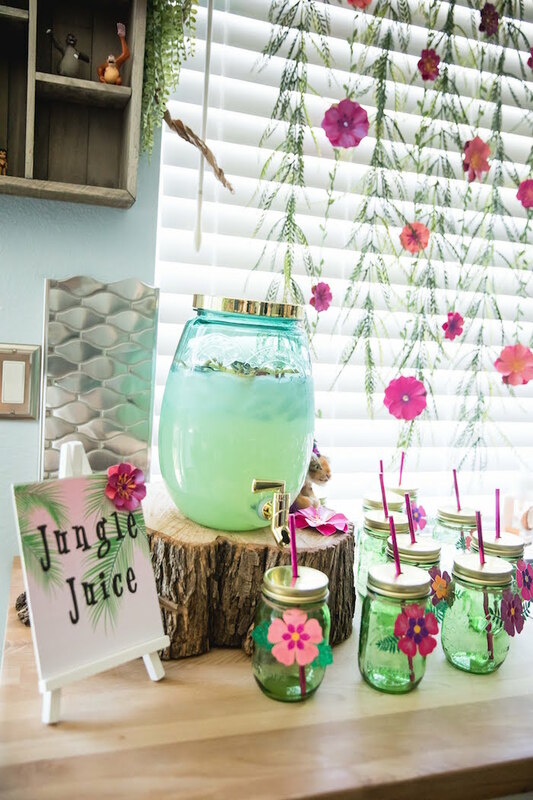 Below was the beverage station where the Jungle Juice sat on a large wooden stump. 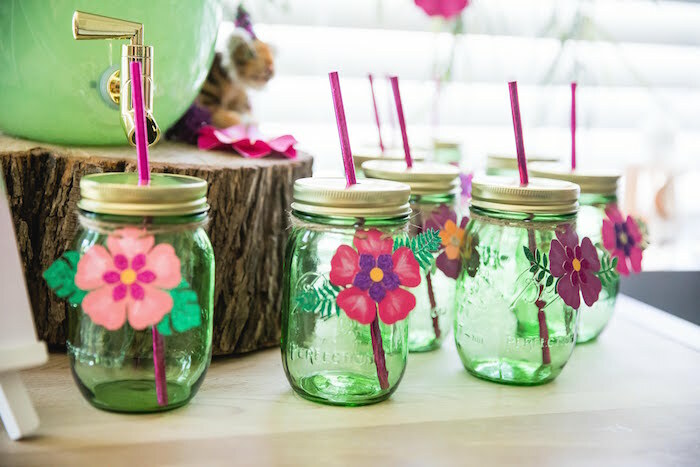 I had some green mason jars that I bought gold straw lids for off Amazon and added handmade flowers tied with twine and a hot pink metallic straw. 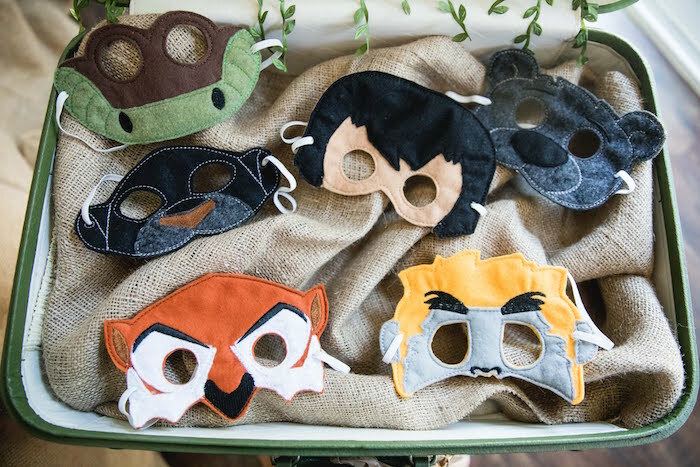 Masks – Mythos a la Mode – Meghann C.
This has to be the BEST Jungle Book Party EVER!! Thanks for sharing. Tiffany you ROCK!! 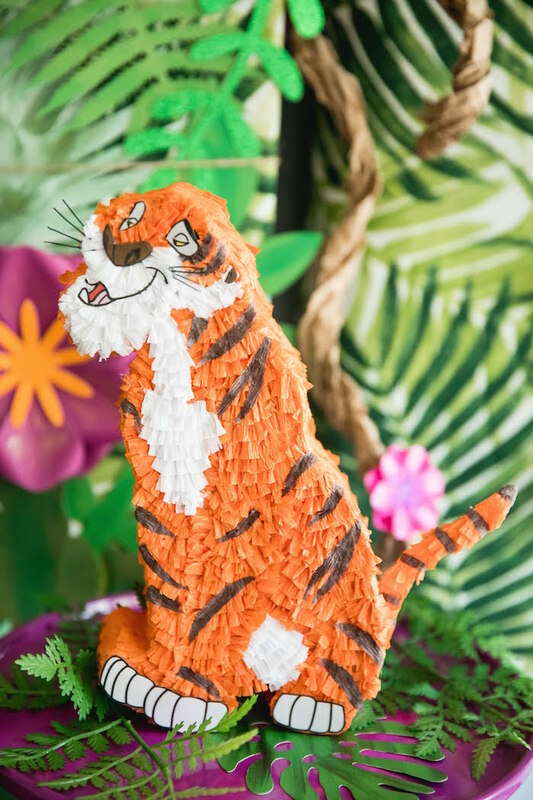 Whole Jungle in a party, this is what comes to my mind when I look at this, you have taken care of every single detail. This looked like an amazing party! 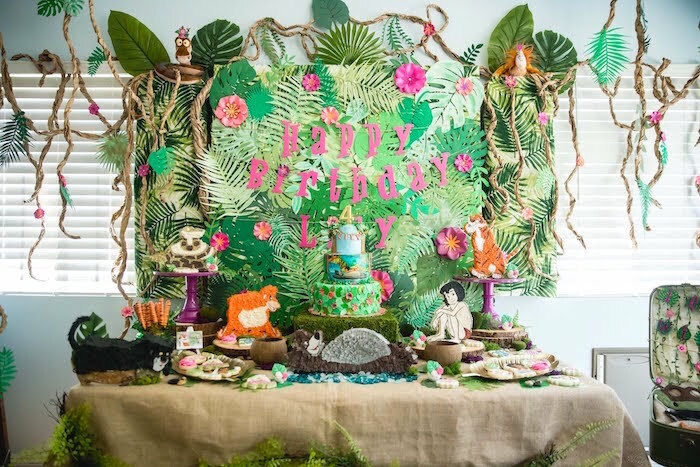 I am planning a jungle book party for my 3 yr old daughter (gotta love a girl who loves jungle book as much as her momma)! 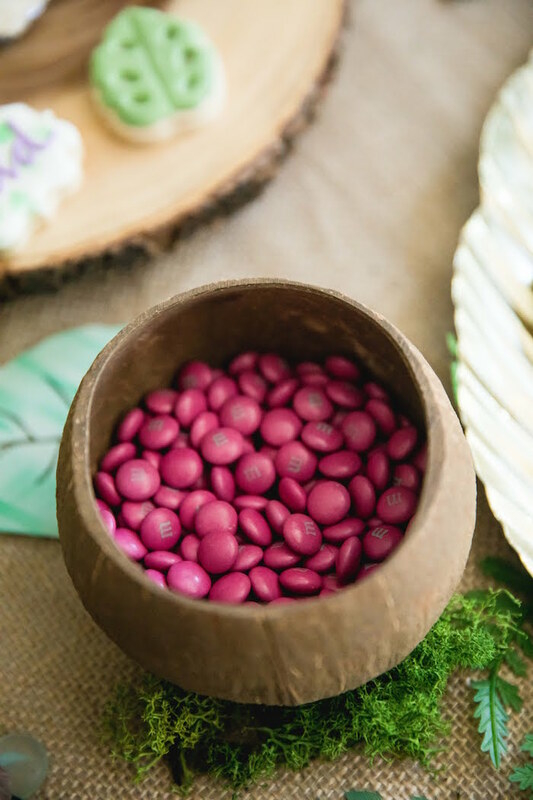 I was wondering if you had any inspiration for an invite. 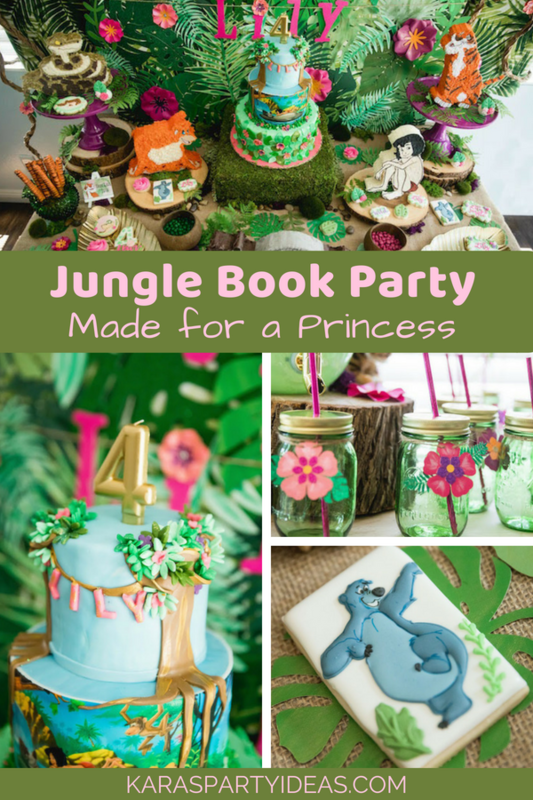 There are so few girl jungle book party ideas out there anything you have would be great! 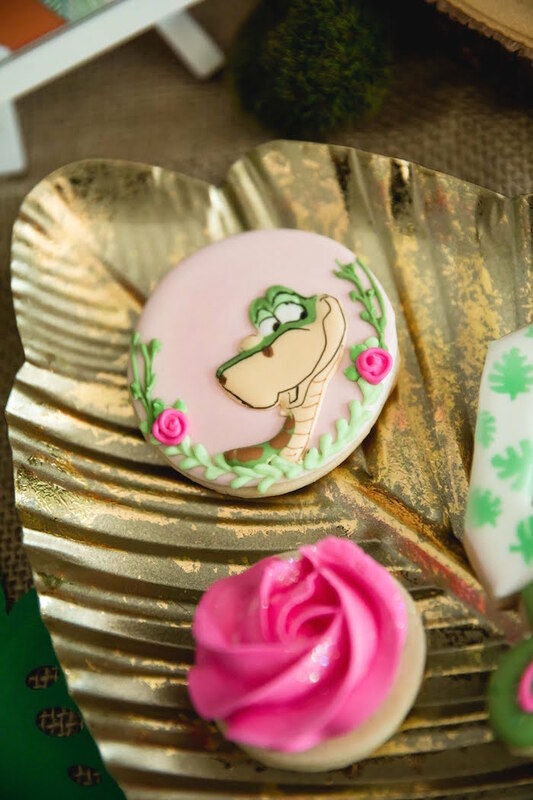 My sister is a graphic designer and will be making the invite! Thanks!! Hi Michelle! Head over to our main page and there is a search box. 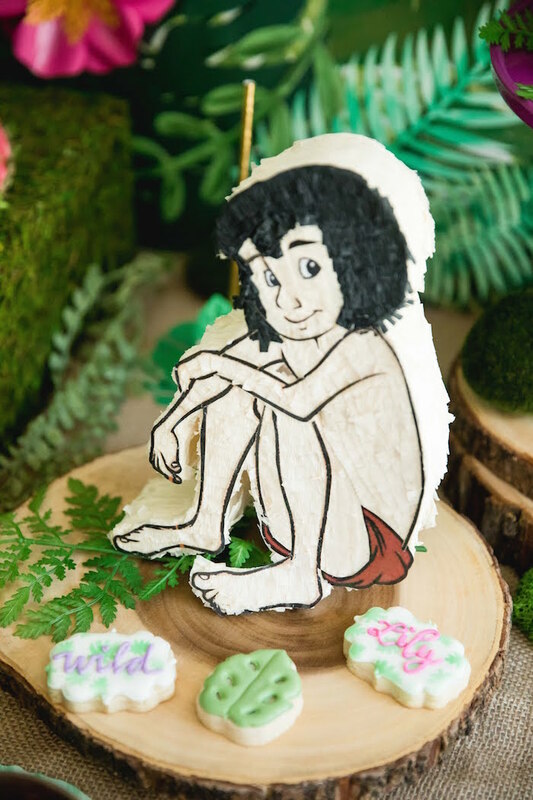 Type in “Jungle Book Invite” and see what you can find there. Good luck!!! XOXO!